Scalloped Aluminium Grating (SAG) is a hexagonal structure formed by electrochemical processing of high purity Al. The two-dimensional hexagonal packaging (see Fig. 1, 2) can be observed within surface domains containing 1500 concaves in average. There are two options for the pitch of the grating, each providing accuracy (HWHM of interconcave distance) of about 6 nm (see Table 1). Fig. 1. SEM image of SAG-102 grating. Size 1x1 µm. Fig. 2. SEM image of SAG-65 grating. Size 1x1 µm. Fig. 3. 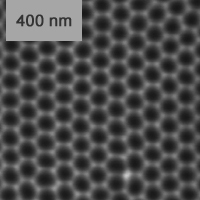 AFM topography image made using probe with 5-nm tip radius. Scan size 900x900 nm, height 40 nm. Courtesy of V. Dremov, ISPP RAS. * Pitch accuracy is specified as the standard deviation of the average value obtained from statistical analysis of SEM images. More than 105 concaves are analyzed. ** Weighted mean value over more than 500 domains is given. SAG are nontraceable samples provided with manufacturer’s statement for the hexagonal pitch, which is derived from the batch measurements. The pitch can be confirmed by measurements on traceable AFM, SEM, Auger or FIB equipment. Fig. 5. Hexagonal lattice pitch. Scalloped Aluminium Gratings (SAG) are high precision hexagonal surface structures that can be used as AFM reference and calibration standards in XY plane1, 2. 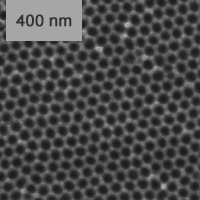 Scalloped Aluminium Grating (SAG) can also be used as an express method of AFM tip quality check3. The hexagonal pattern of SAG consists of concaves and spikes, each concave is surrounded by six spikes. 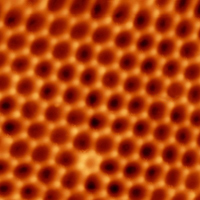 Because of the extremely sharp apexes of the spikes their experimentally observed radii on AFM scans exhibit the sharpness of the AFM tip. 1. K.S. Napolskii et al. Longrange ordering in anodic alumina films: a microradian Xray diffraction study. J. Appl. Cryst., 2010, v. 43, pp. 531–538. 2. K.S. Napolskii et al. Origin of longrange orientational pore ordering in anodic films on aluminium. J. Mater. Chem., 2012, v. 22, pp. 11922–11926. 3. V. Dremov et al. Simple and reliable method of conductive SPM probe fabrication using carbon nanotubes. arXiv:1406.5117 [condmat.meshall]. SCDprobes.com © 2013-2014 ART™ technology of diamond growth and micromanipulation allows production of sharp long-life SPM probes. The diamond tips provide highly reproducible results in AFM imaging, nanoindentation and lithography. The production technology is flexible to changes. Welcome to contact us to modify the tip, the cantilever and the probe for your research the way you need.